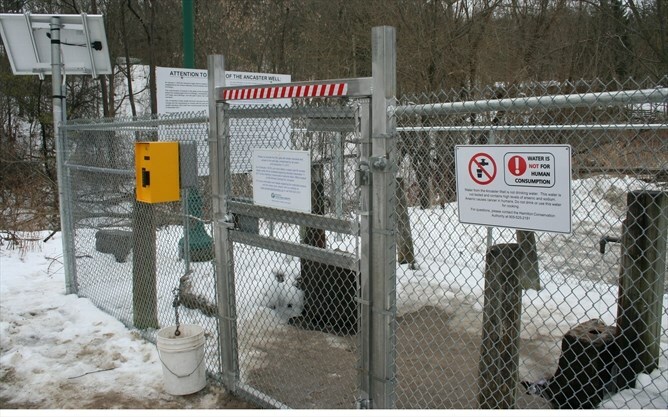 The public still has plenty of thirst for a popular Ancaster artesian well following the Hamilton Conservation Authority’s installation of a new swipe-card entry system. Chief administrative officer Lisa Burnside said 314 people had dropped by the authority’s main office on Mineral Springs Road as of noon on Jan. 15 to sign a waiver and pay a one-time $10 fee for a swipe card. She said the site is inspected daily and there have been no problems or complaints from users. I can’t fully say that we had a real idea how many users there were, so I think we’re just going to wait and see as January plays out if perhaps this is a final number or not.Amid vocal opposition from some users, the authority erected a 1.8-metre gated fence around the Sulphur Springs Road well’s two taps in late November in anticipation of the water exceeding a new arsenic limit of 10 parts per billion that took effect on Jan. 1. Also higher in sodium, the water’s arsenic has typically ranged between 17 and 23 parts per billion — below the old maximum of 25. Burnside said the city’s public health department inspected and approved the new setup on Jan. 2. It includes a prominent sign warning, “Water is not for human consumption,” and a second sign providing details on the arsenic and sodium levels. The waiver people must sign offers a similar caution and advises the water is no longer tested. A new ratepayers association pushing for unrestricted access to the well was unimpressed by the swipe card tally and suggested many people have either found alternative sources, stocked up on water or support its effort. But Chris Krucker, who helped lead the fight to keep the well open, said he’s “quite happy” with the swipe-card system. He said he’s been drinking the well’s water for two decades and continues to do so. Krucker said a new group he and others formed, Valley Water Watchers, will keep working with the authority and politicians to protect the well from future closure threats. Ancaster Coun. Lloyd Ferguson, who pushed for the swipe-card solution, said the public’s response confirms the authority was right to not close the well and let those who sign the waivers choose whether to heed warnings to not drink the water. 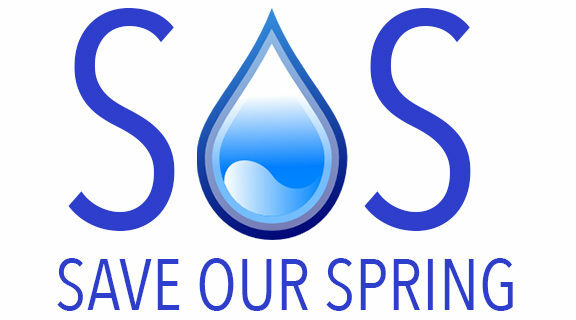 Water is Politics - FREE ACCESS TO THE ANCASTER WELL must be restored. Honour the Deed. Now more than ever it is so important to protect our Artisan spring and restore FREE ACCESS. Hamilton City Council, sitting as the Board of Health and pending ratification at next Wednesday's Council ratification meeting, voted 10-0 to declare a Climate Change Emergency in Hamilton. The effect of the wording is not the same as a "State of Emergency" under the Municipal Act, however, it was chosen to denote the seriousness of Climate Change to the future of our City, and the very question of if humanity will continue to exist on this planet. With approximately 80 members of the public observing the daytime proceedings, Council spent nearly three hours debating. First, a "lite" motion that would've directed staff to research how to act on Climate Change, to create a mandate for a staff Climate Change Task Force. The "lite" motion was amended following strong debating points by Ward 1 Councillor Maureen Wilson, and Ward 9 Councillor Brad Clark. Now the motion called for action, directed staff to report on how the City can accelerate its actions to cut carbon emissions quickly, research and draft changes to bylaws, zoning, policies, and economic growth plans to ambitiously move Hamilton towards being a carbon neutral municipality with the goal of being carbon free. One of the more fascinating dynamics this term of Council is Wilson and Clark, sitting on opposite ends of the horseshoe shaped Council table using their debating points to force Mayor Fred Eisenberger to act upon the positions he articulates - words which are usually empty platitudes with any action by the Mayor. Having secured amendments, and a consensus around the Council horseshoe, to pass a motion that had all the appearances of seriously acting on climate change, it was Ward 3 Councillor Nrinder Nann's turn to push the file forward. Whereas Mayor Fred Eisenberger was concerned about amendments pushing for action were risking dividing Council and preventing an unanimous vote, Nann called the political bluffing. After two hours of debate, Nann put the motion on the floor to declare a Climate Change Emergency "Let's just take the political will and courage right now, declare the emergency and move forward with the plan of action". Water: probably the strangest thing in the universe. Keep your eyes on the Green team legislation! Yesterday, the #ParisGaltMoraine Conservation Act received all party support and passed second reading in the legislature! Mike Schreiner has taken a giant step towards protecting the Paris Galt Moraine. He has worked for months to write the legislation, consulting with water experts, First Nations, municipalities, farmers and MPPs from all parties. While votes often fall along partisan lines, yesterday was different, with unanimous support from all parties. Water protectors everywhere are celebrating. But we can't just sit back and wait. Wherever you live in Ontario, please Call Your MPP and let them know you support Bill 71 and the protection of the Paris Galt Moraine. This bill could pave the way for similar protections for moraines across Ontario. HCA - Please say sorry for your Board Decision of Oct 5th and return our well to Public Access. _ Local friends of this Artisan Well please feel free to attend this meeting and show your support for public access to the Ancaster Well.